What would any Sherlock, or Purrlock, be without a Watson? If you have never read Sir Arthur Conan Doyle's books, Sherlock Holmes was a fictitious English detective, who often outwitted the police and criminals both, simply by thinking about the crime, and by noting things that other people overlooked. To be a "Sherlock", has come to mean being someone who persists in finding things out, sometimes by amazing feats of deduction. In the Sherlock Holmes books, the detective had an assistant, named Dr. Watson. He was retired from the Army, and shared rooms with Sherlock Holmes, and eventually, shared his adventures. When someone refers to their "Watson", they mean a person who is their sidekick, aide, or "right-hand" man. Because the character of Purrlock is a cat, I needed a "foil", for his character. A foil is another character, off which the main character can bounce jokes, ask questions, or in general, who does things that make the main character look good. The purrfect foil for a cat, had to be a dog! But, what kind? Because I have bred and shown Golden Retrievers, people often ask why I didn't use one of them for the character of Watson. Goldens are wonderful pets. They are sweet natured, get along with everyone, and amazingly enough can be smart as a whip and dumb as a rock, at the same time. While there is a lot there for a writer to work with, I really needed a dog who had some feature that could become a "running joke", something that is part of his character, that is repeated at times throughout the story. 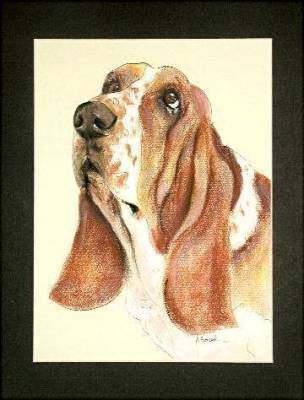 I chose the Basset Hound for their low to the ground shape, and the long ears, which offered the possibility of lots of ear jokes. Is there a real Watson? Yes, and no. There is an inspiration for the character, but he is not a purebred Basset, and his name is "Charlie". In fact, I had a hard time while writing the first Purrlock story, not to put Charlie's name in it. He is one of my favourite dogs, who belongs to someone in our community. Charlie's a cross between a yellow Labrador Retriever and a Basset Hound. From the shoulders up, he looks like a Lab, but his legs are extremely short. He is sweet, funny, and his wonderful, if patient-suffering looks, inspired the character of Watson. of the illustrators for the first Purrlock Holmes book.